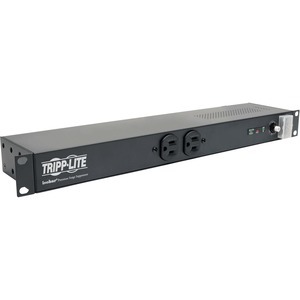 Tripp Lite's IBAR12/20ULTRA offers network-grade surge and noise suppression in a versatile all-metal multi-mount cabinet with NEMA 5-20P input plug and 20 amp capacity. Detachable mounting flanges are configurable for rackmount, wallmount and under-counter installation, using only 1 rack space (1U) when installed in any 19 inch EIA standard rack. Features network grade AC surge suppression with EMI/RFI noise filtering. Outlets are arranged in exclusive isolated filter banks to limit noise interaction among connected items. Includes 12 outlets (2 front mounted 15 amp / 10 rear mounted 20 amp), 15 ft AC power cord and guarded power switch to reduce the risk of accidental shutoff. Diagnostic LEDs indicate AC present, line fault and protection status. Lifetime warranty with $25,000 ultimate lifetime Insurance (USA & Canada Only) coverage .